LensRentals has embarked on a quest to investigate the complicated�topic of sample variation among copies of the same lens.�It’s the kind of fascinating, geeky stuff�we’ve come to know and love from LensRentals, and in the latest round of tests they’ve taken a look at a group of short telephoto primes ranging from 85mm to 150mm. 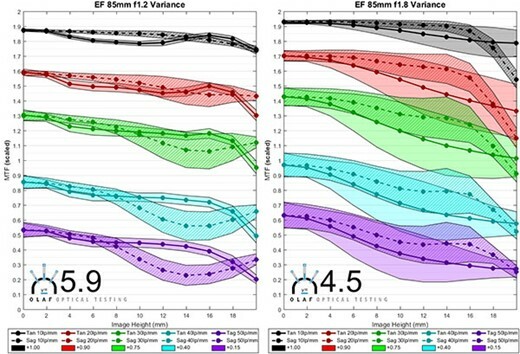 LensRentals not only measured the MTF performance but also looked at the copy-to-copy variation by measuring the results from 10 copies of each lens. This assessment gives a glimpse into some aspects of lens design that usually remain opaque: how consistently a lens can be manufactured to an acceptable tolerance and how well a lens design can be fine-tuned to give the expected performance. For example, have a look below at the aggregate MTF curves for multiple copies of Canon and Nikon 85mm primes. 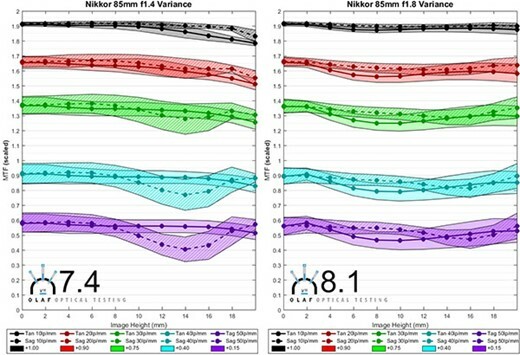 Note the tighter spread of MTF curves for the Nikon primes, which indicates less fluctuation of MTF curves from copy to copy and, therefore, less copy variation. Now, at the price point of the 85mm F1.8s, it’s unlikely that either Canon or Nikon is spending a lot of time tuning each copy, so the better results of even the F1.8 Nikkor suggests that the Nikon design is very well matched to its production methods. * But don’t let us spoil it for you, take a look at the full results. Canon 85mm prime copy variation. Lower numbers are worse. The wider the spread of these MTF plots, the�more the copy variation, and the lower the overall score. Nikon 85mm prime copy variation. Higher numbers are better. The tighter the spread of these MTF plots, the less copy variation, and the higher the overall score. The higher the number, the better (less copy variation). Nikon’s 85mm F1.4 and F1.8 primes both show less copy-to-copy variation than Canon’s similar F1.2 and F1.8 primes. *�Before you get yourself up in a frenzy over the Canon results, do keep in mind that our focus here on the 85mm primes is simply out pure interest in 85mm primes. Roger’s data does not, in any way, suggest that Canon or Nikon, as brands, offer better or worse copy variation across their full lens lineups. It’s far more complicated than that. For example,�there are some newer Canon STM and IS lenses that exhibit the best consistency figures Roger has found to date. Have a look at the tables with more comprehensive figures for various lenses, which you can sort by consistency, in Roger’s article.